In 1986, Eamonn Kilgallon, a fitter by trade, saw an opening in the market for plant hire and sales of construction plant. Eamonn quickly established a reputation under the umbrella of Haven Engineering and in 1993 the Kilgallons seized an opportunity when they bought Celbridge Hire and amalgamated the two companies to form Haven Hire. We weren’t the only ones to see the demand in Naas. There were five hire companies in Naas during the boom and now we are one of the only ones remaining. We put that down to our strong brand. Our range covered everything – the DIY gardener could find what he needed and so could the major construction or engineering site manager. We invested millions in a new fleet. We were, and still are, the archetypal ‘one stop shop’. Haven is a family run, 100% Irish owned company has increased its employment figures by 40% since 2013 and continuing to grow. We also give back to the community by supporting local clubs and charities. Community projects are very important to us as a family-run company. In 2015 we entered a three year sponsorship deal with Celbridge GAA Club in Kildare, one of Ireland’s largest and fasting growing clubs with more than 50 teams not mention its growing success across all 4 codes. 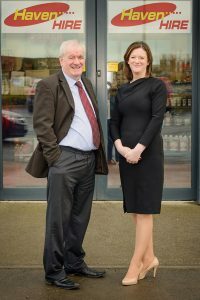 The company has also become actively involved in the North Kildare Chamber of Commerce in the last few years. The organisation has in excess of 300 members across all industry sectors . Audrey Kilgallon was proud to be appointed vice president in 2015 having held an active role on its board in previous years. We have great team of experienced depot managers: John Cummins in Celbridge, Rob Saunders in Naas and Eugene Erritty in Maynooth. In 2014 we employed a new general manager, Michael Howe. The guys have a wealth of knowledge of the industry are all very focused on customer service. We have a great team around us. Michael is ex MD of Toyota Ireland and a great addition to our team. While the plant hire business can appear to be a very male dominated sector, Audrey Kilgallon doesn’t think her gender has been any disadvantage, quite the contrary in fact. Audrey’s very hands on approach to the business has certainly kept her in close contact with our large customer base . Consequently, Haven have developed a great relationship with many of our customers and therein lies one of our core strengths. Audrey was very much immersed in the industry from an early age. Constant customer focus and a large and diverse product range are the keys to continuing success. Hire is very much about the process, ensuring that the quality of each hire is like the first hire and that each customer has a positive experience every time they hire from us. We have forecast a further 30% growth in 2016 which we feel is very realistic and within our scope as a long established hire provider. Haven Hire is a business that has weathered all the recent storms and emerged into the post-recession world stronger and wiser. hire. We carry one of the broadest ranges within the hire industry, which is yet another testament to the experience exhibited over the years by Eamonn & Audrey Kilgallon. Haven provide the A-Z selection of plant and tool hire. We do everything from lawnmower hire for an hour up to a 10 tonne excavator for a longer term construction job. 2015 saw the addition of 10 Ton swivel dumpers to the fleet. that all the tools we supply are right for the job and in excellent condition. Our customer base varies from the domestic user to the large civil engineers and building contractors. A great deal of discipline was required to bring the company through the recession though. Our margins were very tightly managed during the last six to seven years, with a very hands on approach to every cost within our organisation and with all costs under going constant better and tighter was key to maintaining margins. We were fortunate to have had Eamonn’s wealth of experience throughout a difficult few years in our industry. While many operators cut prices in a ‘rush to the bottom’, Haven Hire held its nerve. Customer service is the key to maintaining their clients over the years. We are long established and have a very loyal customer base going back in time – we have people dealing with us for the past 20 years who went very quiet during the recession and they automatically came back to us. Haven service all of their own machines –the support service is in every depot with specialised service staff and we have a mobile service support which will respond within two hours at the latest. In 2008, Haven went into the recession with a brand new fleet. Prior to that our turnover was every five years. But since the recession our machines have lower hours on them and they have all been refurbed so we are getting slightly longer out of them. Growing the business meant making some fundamental changes however. We made the decision post-recession to widen our customer base by supplying machinery that the domestic customer needs. People were no longer just going out and buying equipment for once-off or twice-a-year gardening or DIY jobs, they were hiring instead. Whereas during the boom, people would have got tradesmen to do a job, suddenly they were trying it themselves. That was a really important decision for us. It means we carry a massive range of equipment but we have a much wider customer base. gardening/landscaping, DIY hire and spare parts. We also sell small tools, accessories, PPE and work wear. 2014 & 2015 Haven has also began refreshing its plant again. We have made a major investment in our fleet increasing our numbers of Diggers, Dumpers & our access division we have also added to our tool plant division. and have invested in a substantial marketing campaign for the next 12 months . Social media is a very large part of our promotion strategy. We have introduced a ground-breaking ‘chip’ system which will facilitate the physical tracking of all our machines. Also their maintenance history and check in/check out will all be automated and mobile. These safety records, we are delighted to confirm, will be accessible to our customers to conform with the ever increasing Health and Safety at Work Regulations. 2016 we at HAVEN have hit the ground running with consumer confidence improving in general and there is a good feeling amongst our customers which is a shining light for our future. Our progress has not gone unnoticed. 1. Haven Hire secured the coveted Business Excellence award for Fastest Growing Company in 2015. 2. In 2014, we were shortlisted for SME of the year by the North Kildare Chamber of Commerce. 3. Outstanding Dealership Award from Yanmar. 5. Hire Expo also awarded us Product of the Show. The above awards are a testament to our core strengths. © 2019 Haven Hire. All Rights Reserved.